Maine has 62 lighthouses, of which more than 50 are still in use. 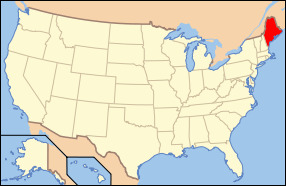 Maine is the only state to border only one other state, New Hampshire to the west. 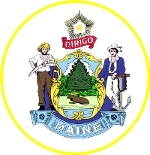 The state of Maine is located within the New England region of the United States and it bordered by the Atlantic Ocean to its east and south, New Hampshire to its west, and the Canada provinces of New Brunswick and Quebec to its northwest and northeast. It is also the northernmost and easternmost region of New England, and is primarily known for the breathtaking scenery along with its jagged and rocky coastline, mountains, and forest. For many thousands of years, only indigenous people were inhabiting the regions that now consists of Maine. It wasn't until 1604 when the Europeans first settled in Maine on St. Croix Island. Shortly after a large number of English settlements were created along the coastline in the 1620s, however many of these failed over those years due to the rough climate, conflict with local people, and deprivations. During the American Revolution and the War of 1812, Patriot and British force contended for this territory. The state of Maine was actually part of Massachusetts until it became the 23rd state on March 15th, 1820 due to the Missouri Compromise. Maine is the 39th ranked most extensive state with a land area of roughly 35,400 square miles, and is also the 41st ranked most populated state with a population of roughly 1.32 million in 2011. The capital of Maine is Augusta, however the largest city in the state is Portland. The states major thriving industries are agriculture (particularly potatoes), fishing (lobsters), ship manufacturing, machinery, electronics, tourism, and footwear. The state has a handful of major rivers and lakes such as the Androscoggin River, Kennebec River, St. John River, and Penobscot River along with Lake Mooshead and Richardsons Lakes. The highest point of elevation in the state is Mt. Katahdin which is 5,268 feet above sea level. Maine was an exclave of Massachusetts until 1820, when as a result of the growing population, it became the 23rd state on March 15 under the Missouri Compromise. Maine is the easternmost state in the United States in both its extreme points and its geographic center. The municipalities of Eastport and Lubec are, respectively, the easternmost city and town in the United States.